We are proud to announce the release of StockMarketEye 4.3.6 for Windows, Mac OS X and Linux. This release fixes minor issues with split data from Yahoo Finance and adds support for importing from a couple of new brokerages. Below is the full list of changes in StockMarketEye 4.3.6. What’s New In StockMarketEye 4.3.6? Fix for split data coming from Yahoo Finance. Added 2 “JP Morgan” brokerages. Added “Cetera Advisor Networks LLC” and “Cetera Advisors LLC” brokerages. Check out our post about the upcoming StockMarketEye v5 release! The next major version of StockMarketEye (v5) is coming soon! We are beta testing it now and hope to have an official release in the Spring. StockMarketEye 5 is a major update and modernization of our easy-to-use investment management software. We’ve added many new features, improved the usability of existing features and updated to a more modern look-and-feel. There are lots of additions and changes in StockMarketEye v5 and we’ll have a complete list available at the official launch. In the mean time, here’s a quick overview of some of the enhancements coming soon in StockMarketEye 5. New Look : Light and Dark themes with an easily changeable font size. See the screenshots below! New Data Provider : A new source for quotes will be available, covering markets that are not well served by Yahoo Finance (such as Canadian mutual funds). Improved Usability : We’ve redesigned many features to be easier and faster to use. Updated Reports : Reports have become even more flexible and powerful, making it now even easier to get the information you need to make informed investment decisions. Improved custom date range selection. With the release of StockMarketEye 5, we will be implementing a new pricing structure. If you’re currently on the trial version of StockMarketEye (v4) and your trial ends before v5 is released, don’t hesitate to get in touch with us for a discount on your v4 purchase. Stay tuned for StockMarketEye 5, coming this Spring! 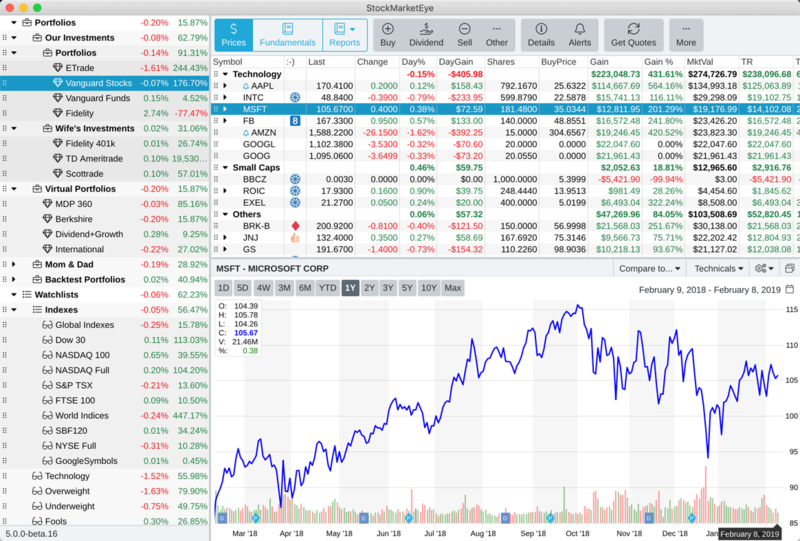 We are proud to announce the release of StockMarketEye 4.3.5 for Windows, Mac OS X and Linux. This release fixes issues users were having with importing from Merrill Lynch as well as issues with sorting certain columns in a Watchlists. Below is the full list of changes in StockMarketEye 4.3.5. What’s New In StockMarketEye 4.3.5? Fixed issues with importing from Merrill Lynch. Fixed issues with sorting of some watchlist columns (such as ” % < Watch"). Added “Principle Financial Group” brokerage. We are proud to announce the release of StockMarketEye 4.3.3 for Windows, Mac OS X and Linux. This release contains additional columns for the Gain/Loss report, as well as fixes for minor issues with the brokerage import and reports. Below is the full list of changes in StockMarketEye 4.3.3. What’s New In StockMarketEye 4.3.3? Added totals for Open Costs, Open Fees, Close Costs and Close Fees columns in the Gain/Loss report. Improve normalization of incoming Yahoo Finance historical data to avoid having huge candles that could distort the chart. Fix for MorganStanley “sell debt” transaction imports that would only specify a total value. Fix for Return of Capital transactions were not taken into account in the average cost basis (ACB) calculation. Fix for the brokerage import from USB Financial Services due to a certificate change at UBS. Fix for passwords not being saved in certain cases of the brokerage update process. Fix for a potential issue in Back-in-Time report when the selected day is ‘today’. 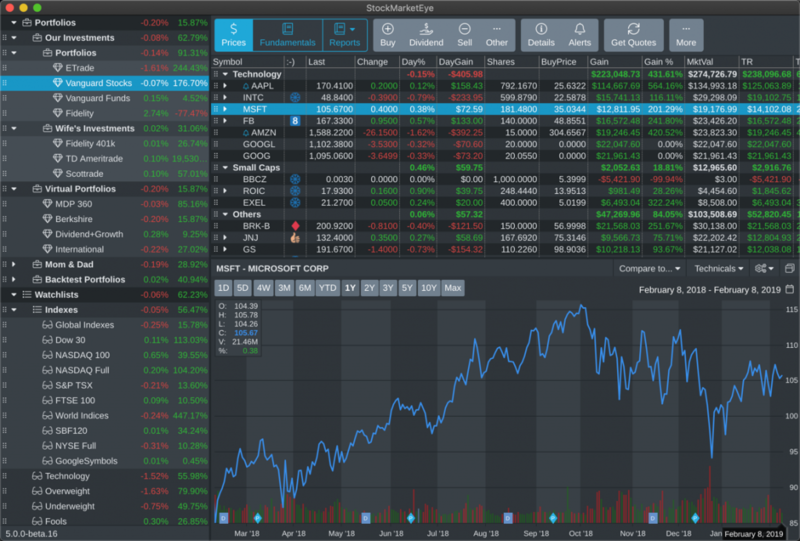 We are proud to announce the release of StockMarketEye 4.3.0 for Windows, Mac OS X and Linux. This release focuses on stability and compatibility, while adding important new features to inform you of what StockMarketEye does with your personal data. The security of your personal data has always been of utmost importance to us. That’s why StockMarketEye stores your data on your computer, rather than on a server. The one exception to that rule is if you use our on-line sync service. If you choose to use this optional service, a copy of your data will also be stored on our server so that you can access it from other computers or devices. We have also added a new consent window before using the on-line sync service. The on-line sync consent window explains what data is transmitted, where it is stored and how you can modify or delete your account. Below is the full list of changes in StockMarketEye 4.3.0. What’s New In StockMarketEye 4.3.0? New EULA consent window on first run of StockMarketEye. New consent window before showing the on-line sync window for the first time. Increased the limit of characters in the comment and description columns to 10240 characters. Added tweaks for aligning UK ticker’s historical and live quotes to pence or pounds. Replaced all Google Finance ticker symbols in Benchmark and Compare to dropdowns with Yahoo Finance equivalents. Optimizations to speed up StockMarketEye when adding new items to a portfolio. Fix for market value chart that could sometimes be spiky on last day. Fix for potential double entry for today in historical market value chart. Fix for incorrect portfolio name in Gain/Loss report of a Portfolio Group. Fix for bulk watchlist import of symbols that have hidden characters. We are proud to announce the release of StockMarketEye 4.2.8 for Windows, Mac OS X and Linux. This release has a few minor updates and fixes which improve the stability and compatibility of StockMarketEye. Below is the full list of changes in StockMarketEye 4.2.8. Change to the way “Day%” is calculated to account for incorrect previous “Close” values from Yahoo Finance. All former Google Finance tickers from “TYO:” to be priced with historical quotes (just like “LON:” tickers in the previouls version). Fix for issue affecting the adding of watchlist items to a category. Fix the sorting of the “YOC” column. We are proud to announce the release of StockMarketEye 4.2.7 for Windows, Mac OS X and Linux. This version of StockMarketEye focuses on performance improvements and UK users who have found issues with Yahoo Finance ticker symbols. A number of users have had performance issues with our last release, StockMarketEye v4.2.6. We’ve worked with many of them to narrow down the issue and find a solution. StockMarketEye 4.2.7 includes all of the performance improvements we’ve found and should run smoothly. UK users have had problems converting some of their ticker symbols from Google Finance to Yahoo Finance ticker symbols due to data quality issues with the Yahoo Finance ticker symbols. To help those UK users who have ticker symbols that are not covered well by Yahoo Finance (this includes smaller securities and some funds), StockMarketEye 4.2.7 allows you to continue using Google Finance ticker symbols for UK based securities (i.e. tickers that begin with “LON:” and “MUTF_UK:”). Pricing (i.e. the “Last” column) will be end-of-day (EOD) closing price for these ticker symbols. This allows holdings to be priced correctly (although not live) and up-to-date market values to be calculated. StockMarketEye will use the currently still available EOD historical data from Google Finance for these symbols. As long as the historical data for these symbols is still available from Google Finance, this will be a viable option for “LON:” and “MUTF_UK:” ticker symbols. This also means that the chart data for these securities will come from Google Finance, which is a significant improvement for these smaller UK securities as the Yahoo Finance data can be quite poor. Note that Google Finance ticker symbols will not appear in the symbol search results. But you can still add them – just ignore the warning that says the ticker symbol is unknown. Below is the full list of changes in StockMarketEye 4.2.7. Performance optimizations to fix freezing and sluggishness. All former Google Finance tickers from “LON:” and “MUTF_UK:” should use historical quotes. Upgrade internals on all platforms for stable 3rd party libraries. Right align all date columns. We are proud to announce the release of StockMarketEye 4.2.6 for Windows, Mac OS X and Linux. This release concentrates on improving the user experience in the aftermath of the Google Finance disruption. We’ve also fixed some bugs and added minor performance improvements. As of StockMarketEye 4.2.6, we no longer support Google Finance as a data provider. The vast majority of securities covered by Google Finance are also covered by Yahoo Finance and we therefor recommend that you convert your Google Finance ticker symbols over to Yahoo Finance ticker symbols. There are, however, cases where Yahoo Finance does not cover a particular market or set of securities, for example Canadian mutual funds. In these cases, StockMarketEye will continue to try to get end-of-day (EOD) quotes from Google Finance. Retrieval of EOD quotes for these markets/securities will work as long as the last Google Finance access point is still open. Below is the full list of changes in StockMarketEye 4.2.6. Removed GoogleFinance as a data provider except for markets that are not covered by Yahoo Finance – this includes, notably, Canadian and other non-US mutual funds. If you have Google Finance ticker symbols for these types of securities, you do not need to change them. This will work as long as the old Google Finance access point for these securities remains open. Improved the charts and historical data retrieval for some UK, DE and CH securities which had inconsistent EOD data from Yahoo Finance. Fix for dividends/yield values for UK stocks. Fix for ROE and ROA being off by factor of 100. Aligned calculation of TR for multi-lot holdings and partial sales with the IncomeTotal calculation. Fix issue with Capital One brokerage import. Improved the Summary report to use manually edited Last values if the end date of the report is today. Fixed case where imported historical quotes (from CSV) were not used in the Prices view for non-quoted items until after a restart. Performance improvement for 52W and AllTime fundamental columns. Show the Category name in the Name column for Watchlist categories. Updated internal libraries on Linux to help startup issue on newer debian systems.